Oh adorable little (not that little) director’s chair, I have my eye on you for some bonafide fabulous outdoor seating. 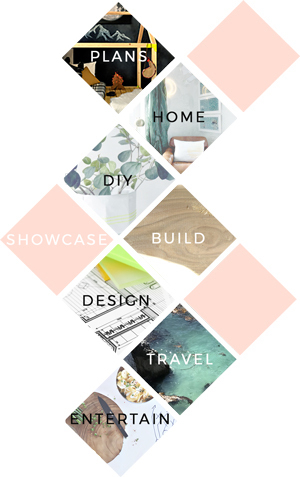 Perfect for indoor use or the great outdoors if you use an appropriate specie of wood; I love that this plan can be made to suit your own personal decor. Note: *If you plan to paint or stain the wood pieces, please do so before attaching the fabric. Cut the pieces for the Backs. Next, cut the Fabric Backrest. Turn under long edges of the Backrest 1/2”, iron, and then turn them under another 1/2” and iron again. There will be no need to do this to the short edges of the Backrest, since they will not be visible. To secure the edges of the fabric, you can use iron-on adhesive, fabric glue, or sew the edges. 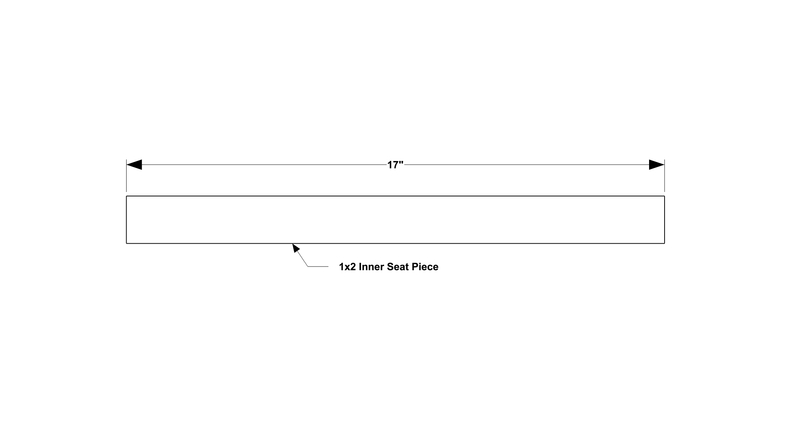 Place the Backs on the Fabric Backrest as shown and secure into place with staples. “Roll” the fabric onto each Back. To do this, you can roll the Backs toward the center of the fabric so that a total of 9” of fabric is rolled onto each Back. For extra strength, you can staple the fabric-covered Backs, or use decorative upholstery nails. 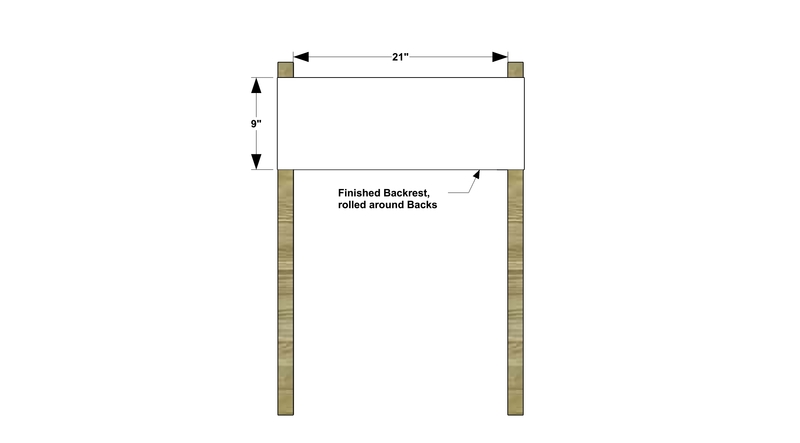 You should be left with approximately 21” of fabric between the two Backs after “rolling.” When assembled, the Backs will be 20” from each other, with 1” of “slack” in the Fabric Backrest. Cut the pieces for the Fronts, Arm Rests, Outer Seat Pieces, and Bottoms. With the Kreg jig set for 1-1/2” material, drill pocket holes in the top ends of the Fronts, the back ends of the Arm Rests, and both ends of the Outer Seat Pieces and Bottoms. Assemble as shown with glue and 2-1/2” pocket screws. You may want to set up some type of support on the sides of the Chair since it may be floppy until the Cross Supports are assembled. Next, cut the piece for the Fabric Seat. Turn under long edges of the Seat 1/2”, iron, and then turn them under another 1/2” and iron again. There will be no need to do this to the short edges of the Seat, since they will not be visible. Next, cut the pieces for the Inner Seat Pieces and Cross Supports. With the Kreg jig set for 3/4”, drill pocket holes in both ends of the Cross Supports. Refer to graphics to see which direction your pocket holes should face. Don’t attach anything just yet! 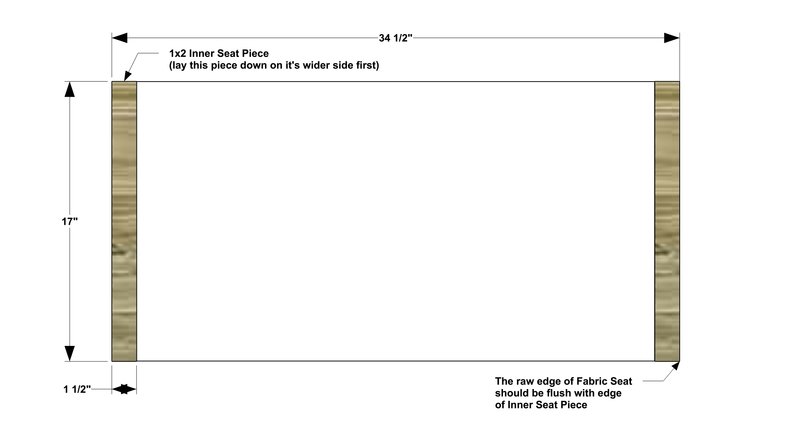 Place the Inner Seat Pieces on the Fabric Seat as shown and secure into place with staples. “Roll” the fabric onto each Inner Seat piece. To do this, you can roll the Inner Seat Pieces toward the center of the fabric so that a total of 6-3/4” of fabric is rolled onto each Inner Seat Piece. For extra strength, you can staple the fabric-covered Inner Seat Pieces, or use decorative upholstery nails. 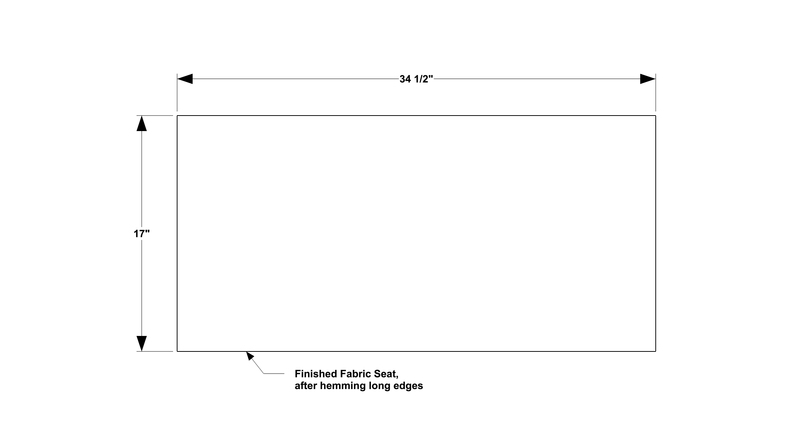 You should be left with approximately 21” of fabric between the two Inner Seat Pieces, with 1” of “slack” in the Fabric Seat. Attach the Inner Seat Pieces to the Outer Seat Pieces as shown with 1-1/4” wood screws. Next, attach the Cross Supports as shown with 1-1/4” pocket screws. You may have to play a little with the exact position of the Cross Supports (use the graphic as a starting point). Use 1-1/4” wood screws at the point where the Cross Supports cross one another. This is not a folding directors chair , is it?